Besides being a beautiful church and a part of Chicago history, Maria and Gavin have a special connection to Old St. Pats. When Maria was in law school she lived with her sister, Danielle, in Little Italy, about a 20 minute walk from Old St. Pats. Maria and Danielle often attended mass at Old St. Pats, stopping for brunch in Greektown on the walk home. The day after Maria and Gavin got engaged they were in the city for Bike the Drive and wanted to go to mass after. Maria could think of no better place to bring her Irish fiancé than Old St. Pats. Upon seeing the church, Gavin immediately felt comfortable there. The Celtic symbols that adorn the church match the symbols that Gavin designed into Maria’s engagement ring. During that after-engagement mass, a statute of Gavin’s favorite saint, St. Kateri Tekakwitha, overlooked the couple. 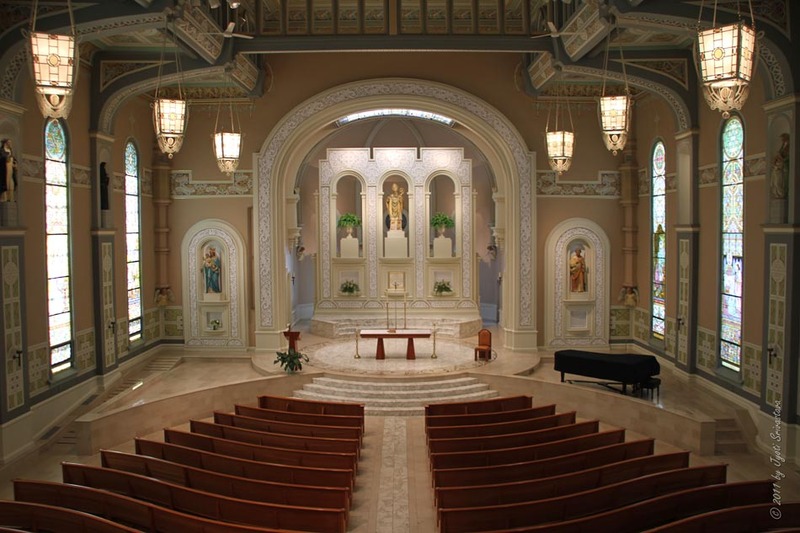 Finally, Maria and Gavin’s home parish, where Gavin received all of his sacraments, is also named St. Patricks. 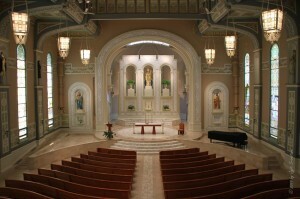 With that, Gavin and Maria knew that a wedding in Chicago would only be complete with a ceremony at Old St. Patricks. 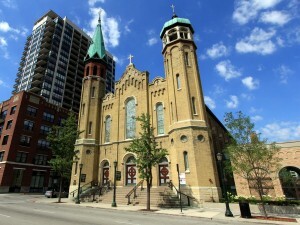 Old St. Patrick’s was founded on Easter morning in 1846 as the first English speaking church in Chicago. It grew, serving an Irish-American community. Old St. Patrick’s is one of the few buildings to survive the Great Chicago Fire of 1871. This makes it, not only the oldest church in Chicago, but also the oldest public building in the city. Inside the church, you will find beautiful stained-glass windows inspired by the Celtic art exhibit at the Columbian Exposition of 1893 and the Book of Kells. The church is decorated with Celtic designs, including Celtic knots, triquetra, and other traditional Irish symbols. In 1977, Old St. Patrick’s was listed on the National Register of Historic Places. Today, Old St. Pat’s is known throughout Chicago for hosting the ‘World’s Largest Block Party”.